In the second week of the build, the first two freight car kits were completed to the stage before the paint booth phase. The next two freight cars were prepped for assembly. Click on any image below to review a larger version. Northern Pacific 36-foot, double sheathed box car. 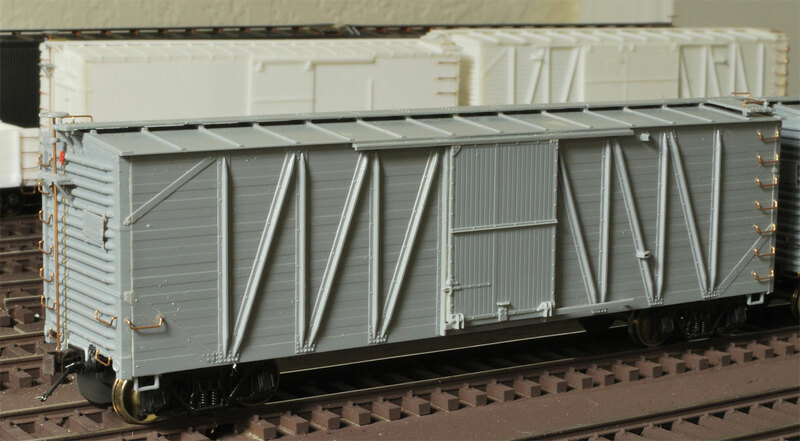 The sides, ends, and roof assembled easily on this Northern Pacific box car kit. The under frame needed to be sanded to fit, then the couplers were installed. Grab iron installation was straightforward, with the running board and brake details to wrap up. As this model has a deep fish belly side sill, I did not install any brake system detail on the underside. I really like seeing these details in profile on a model as the layout surface sits at 52 inches, but there would only be a slight nub of the brake system visible. I decided to take a shortcut to the finish line and leave the details for the next build. 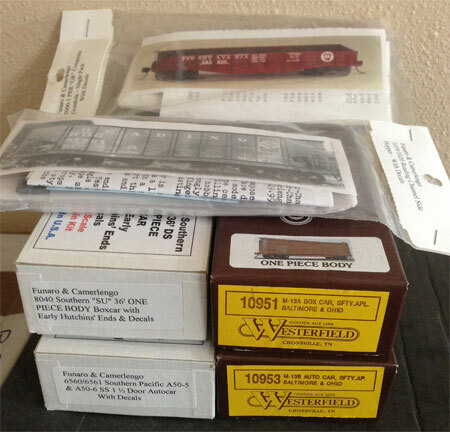 I’ve been unable to find much detail on the prototype Northern Pacific box cars. The 1926 ORER lists a few different number series for box cars of more than 36 foot outside length. NP 37339 can be seen in this early image of Duluth. The car is just to the right of center and in the lower half of the image. It seems to have similarities to the 38300-39049 cars but additional photos are needed for a good comparison. These short cars are just a small percentage of the 26,713 box cars in the 1926 Northern Pacific fleet. I’ve been trying to purchase kits that are representative of prototypes with a few thousand of the same car. Obviously I did not do my homework on this one. But this kit is another good experience and confidence builder for your next challenge. And there will be challenges. This 50-foot mill gondola is an interesting prototype. 2000 seem to have been on the Union Railroad roster for almost two decades. These cars held the 6000-6999 and 9000-9999 number series, as per the F&C kit instruction sheet. All seem to be gone from the Union Railroad by 1957. Early in 1953 a few batches of gondolas were parsed out to other railroads: 100 to the McKeesport Connecting; 200 to the Lake Terminal; and an undetermined number to the Aliquippa & Southern. In 1964, 26 of these cars ended up on the Bessemer & Lake Erie. The coupler and end sill installation is a bit dicey and not that simple for a beginner. Lastly, there was no indication to install grab irons that are of a half-drop style. I only noticed the grab irons after most of my build was completed and wondered why several of the grab irons have a slight angle. A careful review of the prototype drawing will reveal these are special grab irons that are straight on one side and have a drop on the other side, like a sideways L. It is this kind of detail I enjoy adding to a model as it is a unique component but there was no mention of this in the instructions. It’s a nice model, but it could have been much better with clear, concise instructions that assist a modeler with proper assembly and note unique prototype elements. End view of the Union Railroad mill gondola. 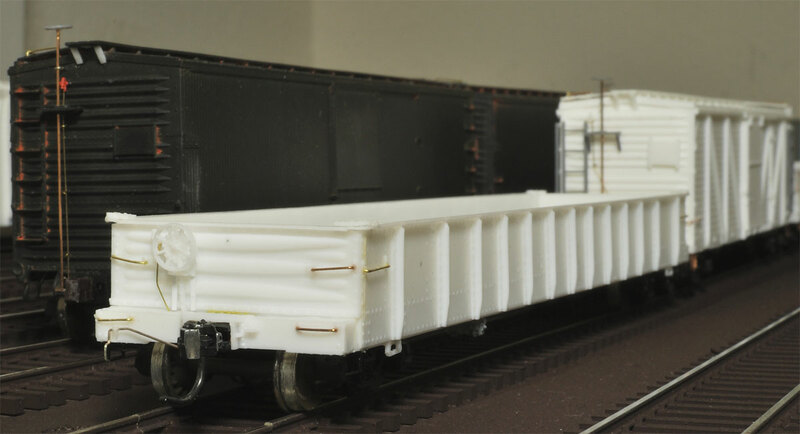 In addition to these resin freight car kits, I upgraded three Tichy USRA single sheathed box cars and two Accurail USRA double sheathed box cars. The Tichy cars were damaged in a freak accident a couple of years ago. I rediscovered them and found the damage was minimal. The Accurail cars are part of a half dozen that I’ve been pushing along with extra details. 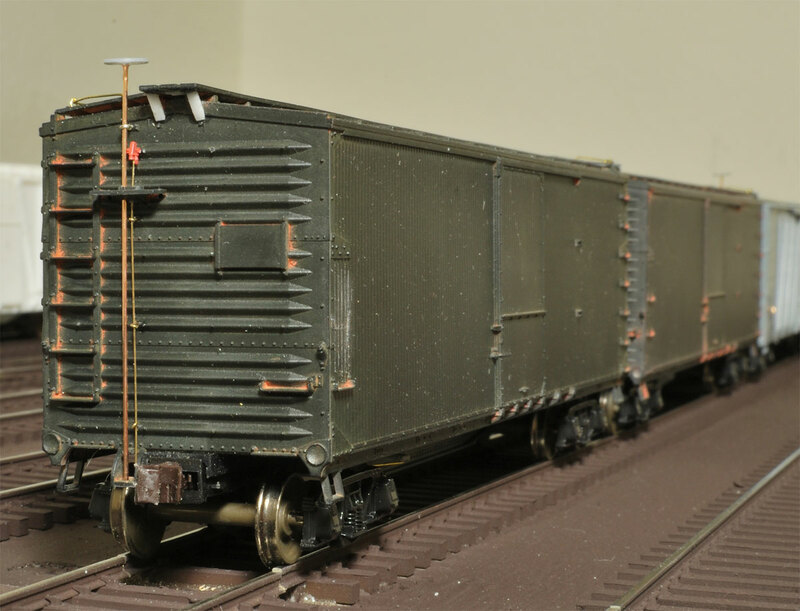 Tichy USRA single-sheathed box car. Accurail USRA double-sheathed box car. The completed builds are piling up, but there are more recent builds to share! Please post any question or comments below. All comments are reviewed and approved before they appear. Real nice models Eric, hope you got the email and links I sent. It’s nice to see how your freight car fleet is coming together. I wish I’d been “ready” to tackle a resin car project while you still lived in the area. Keep posting your pics and progress; one day I’ll have Pictures of my own to share in return! I am pretty sure the Lake Terminal and McKCRR cars were built new at about the same time as Union’s 2000. There are builder’s photos of these along with photos and plans for the URR car in one of the ‘Cycs. I planned to scratch these one day. There are subtle differences between the Union and McKCRR cars, look at the grab mounts on the right hand side. IIRC McKRR has a bracket that URR does not. They also mostly disappear around 1950. I have seen a post on another list that states these were rebuilt to Union’s shorter class G-11 gondolas. I cannot verify, but the almost complete disappearance of the Union gons was a mystery to me. I have one of these to get working on, but it is down in the cue right now. Thanks for those details, Charlie. I based the text here upon the prototype details offered in the F&C instructions. From the way the gondola fleet numbers are noted in the instructions, the increases for the Lake Terminal and McKCRR correspond with similar decreases of URR gondolas. Most of my prototype references focus on the pre-Depression era so I did not have any later ORER to review. Another question came up while I was building this gondola. The instructions note the URR 9000 and 6000 series were the same, but there is only an image of 9000 series gondolas. Have you found any images of the 6000 series cars? If so, are they the same? Yes, the 6,000 series are the same from builders photos I have seen. I may have given mine to Guy Wilber years ago. The Union cars were at least partly built by Magor, and the McKeesport Connecting cars and the Lake Terminal cars were not. They in turn came from different builders as well. Just be away to look closely at the at least the McKCRR cars because the top side RH grab is on a different-style bracket than the Union cars. I just misplaced my file on these (how???) prepping the room for construction of the staging level. Those are most interesting details, Charlie. Thanks for posting. We are spoiled by the amount of prototype detail offered in the Westerfield kit directions. I’ve encountered few situations where I am scratching my head wondering about certain elements of the prototype, but I’ll guess there are a couple of Westerfield kits where the data is cloudy. I wish the prototype details were presented better in the F&C kit instructions as the instructions on most of my F&C builds have been very murky, at best. Ertl USRA double sheathed box cars as well as those from Accurail which you have. The Ertl cars can often be found on eBay for prices in the $10 – $12 range and can be repainted and decaled to come up with some really acceptable models. I for one still like house car models on which the doors can be opened, as they can on these and the Tichy USRA single sheathed cars, but do not have gross features to enable them to be opened.